In the past decade, we have seen HBCUs in general attempt to increase their academic standards for admissions for a number of different reasons. Unfortunately, as is often the case it seems with HBCUs and African America in general this move is done in isolation and not in conjunction with the rest of the ecosystem. As a result we are seeing K-12 outcomes for many African Americans in this country getting progressively worse or stagnant in most of the country. If the pipeline that produces your core student demographic is not improving its academic outcomes, then how can HBCUs not expect student shortages that leave them with tuition revenue shortfalls. Of course some of this is being done as accreditation agencies squeeze HBCUs due to high default on student loans by former HBCU students and alumni. There are also those whose answer to “fixing” HBCUs is to gentrify them thereby diluting our institutional and cultural power. Where have we seen that playbook before? The real answer to the quality of student HBCUs are getting lies in HBCUs and their alumni investing back down the educational pipeline from which their core students come and strengthening it so that future HBCU students have strong academic prowess before they even get to our campuses. Boarding schools in this country have a long, rich history, and their current value today can not be understated. They tend to have an extremely competitive admissions process, tuition and faculty that would make more than a few colleges blush, and endowments that Historically Black Colleges & Universities dream about at night. The Forbes’ list of America’s top 20 boarding schools paints quite an amazing picture of what pipeline behavior is suppose to look like. The median percentage of these twenty elite boarding school graduates going into the Ivy League/MIT/Stanford pipeline is 30 percent. Three times the percentage HBCUs are getting from their core demographic. Their faculty has a median of 76 percent with advanced degrees. At Philips Exeter Academy almost 13 percent of their faculty have PhDs. Yes, a high school with PhDs teaching. Imagine for a moment the first time most African American students who come to HBCUs have encountered a PhD level professor. It is usually not until they have reached college and some may not see one until they have reached their major classes, whereas these students are coming out of high school with four years tutelage under PhDs in the core classes of english, history, math, and science. Lastly, the endowments among the top twenty (with 3 schools not reporting) have a median of $105 million, average of $204 million, and combined value of $3.5 billion. Seventeen prep schools have combined endowments valued at twice the size of 100 HBCUs. A startling revelation if ever there was one. It has been noted that prior to desegregation, “there were nearly 100 black boarding schools in the U.S. before the 1960s, established by local blacks, religious organizations and philanthropists, when the local governments failed to provide schools for black children” and as it stands today, there are only four remaining. Over 50 years later while the number of black boarding schools have dwindled, African American education outcomes have also plummeted in parallel. Recent reports put the African American male high school graduation rate nationally at an abysmal 52 percent. It is clear that as we gave up control of our own education institutions that our ability to garner positive education outcomes became increasingly harder and harder to achieve. The four remaining survivors Laurinburg Institute in North Carolina, Pine Forge Academy in Pennsylvania, Piney Woods in Mississippi, and Redemption Christian Academy located in New York. Their geography alone is both a gift and curse. It allows each to have a strong territory of its own, but makes it virtually impossible to engage in joint activities like athletics and the like given the cost of travel for institutions that are largely cash-strapped much like their higher education brethren. It is hard to imagine that if African Americans have not been proactive in the way of funding HBCUs, that AABSs will fare much better in recruiting high-quality or transformative donors. The reality though is not only does that investment need to be made, it needs to be made at a larger rate than we could even possibly make for HBCUs. It does not matter what we do at the collegiate level if we do not at some point fix the early childhood to secondary education institutional pipeline. We will continue to overburden our HBCUs with developmental students and be subject to calls for faux diversity that whitewashes our institutional power as we make our usual overabundance of concessions to make others feel welcomed. HBCU strategy must involve investments in the K-12 system either through pre-K programs on the campus and K-12 charter schools either run by the HBCUs themselves, HBCU alumni, or HBCU support organizations. To that last point, there are rumors that the HBCU Endowment Foundation and Center for HBCU Media Advocacy are in talks to form a partnership that would create a boarding school. This is in addition to the HBCU Endowment Foundation’s long-term plans to be involved in early childhood education in the form of an HBCU version of Head Start. It would not hurt at all if the five HBCU conferences (SWAC, MEAC, SIAC, CIAA, GCAC), Divine 9, UNCF, and Thurgood Marshall Fund joined and created their own schools also either independently or jointly. For generations and then some, HBCUs have led the way to producing African American teachers and principals. It is time we go ever further and start to create a culturally relevant school system (pipeline) that is tailored to the needs of our children and communities there within. An earlier investment would pay significant dividends to building a rapport in our community’s psychology well before it is even time to choose a college. Currently, most of our kids’ see nothing but HWCU/PWIs throughout their childhood and do not come into contact with an HBCU until almost a last resort. That has to change and the quality of education that our children have not gotten since before desegregation has to change. We need to be on their mind from the moment parents are expecting their child as the place that will ensure the best education for that child from early childhood through college. HBCUs have been sculptors who for the past 50 years who have done the best with the clay they were given, but sometimes the sculptor must step back and create their own clay to make the beauty in their work fulfill its greatest potential. 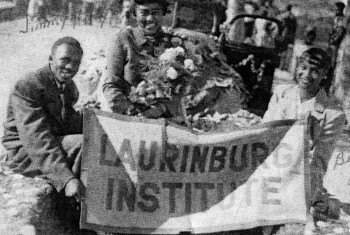 This entry was posted in Lifestyle and tagged black boarding schools, boarding schools, laurinburg institute, pine forge, piney woods, redemption christian academy. Bookmark the permalink. Excellent article that looks at historical trends and leaves room for future options to improve the college attendance and persistence rate for HBCU’s and other institutions. I am in the process of developing a boarding school for African American males, in Ohio. Plans have been developed and a potential location has been selected. We are looking for funders to help make this dream a reality. If anyone is interested, please contact me. I’d be interested in learning more about your plans for the boarding school. What other marketing strategies will you employ to get the word out about the school and garner support? I came across this article because I’m interested in sending my children to an African American oriented private school. I am so disappointed that there are only 4 remaining and none of them are in the state of Texas. Go to the church and professional athletes…set up a go find me page as well….you should drop this article with your request in every black social media outlet available. Excellent article. Even if we do not increase the number of AA boarding schools, it would be nice to bring back the laboratory schools on HBCU campuses. My grandfather insisted that my brother attend the AA Military boarding school in Va., however I can never say enough about the experience I was afforded by attending the laboratory school on an HBCU campus. If you are still interested in the school I am developing, please contact me at rmurphy452@gmail.com or dr.murphy@mastersprepohio.org. Love this article…never heard of black boarding schools…there should definitely be pages set up on social media outlets or some charitable event associated with the group. Check out our website. mastersprepohio.org We are developing a nonprofit boarding school for African American males (501c3). We are working on fundraising strategies as we speak. Please email me if you would like additional information. rmurphy452@gmail.com or dr.murphy@mastersprepohio.org. Excellent article! I find it alarming that only 4 schools remain standing to date. I am a PhD. Student at FAMU, this topic of “AABSs” will be my research of interest. My long-term goal is to create an AABSs here in the state of Florida.